This is "the" TV game show bible, with information on over 500 shows, including many from the 40s and 50s, plus tons of photos. This interesting book provides not only a lot of behind-the-scenes information about popular shows but also explains how game shows were invented and became popular. This book is specifically about The Price is Right (TPIR to its true fans), with information about everything from Plinko to "Barker's Beauties" (and of course, plenty about Bob). The book was released before Bob retired, so it has nothing about Drew Carey, but if you love TPIR you'll really like this examination of its history. Lots of behind-the-scenes and never-before-told stories about the show, too. If you're a fan of the personalities behind the shows, you'll like this book: it profiles 32 game show hosts, from the original hosts (Bill Cullen) all the way to contemporaries (Regis Philbin). Lots of interviews and facts. 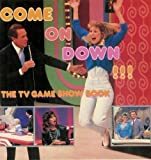 This light book is a fun, fabulous look at game shows from the last 50+ years. There are are a lot of random bits of information that make this book perfect "bathroom reading." I live in Los Angeles, where it's not really about reading, it's about movies -- yet given the choice, I usually prefer to curl up with a good book. Most of my reading gets done on airplanes or laying in bed in that quiet hour right before lights-out. I'm also known to collect pretty much every book having anything to do with Disney's theme parks.